around St. Petersburg close to 2000 schools, each of them has on the level of 6 classes qualified to visit Hermitage Museum for many reasons, 12000 classes divide by 300 school days in the year, - so in order to keep nation floating you should be able to see somewhere close to 40 classes during one day or 10 per hour, because they can visit only during the morning hours. What have you seen in Hermitage, it was probably commercial lyceum, only few people can afford it. Kids asking to patents: "how much did they pay for passing the unit", and answer "nothing" considered as a joke. I spoke with few of my friends, and folks told me level of bribe, in some cases, they have to pay per year for kids to study is close to $16k, I ask them why to bother with Russian universities at all, when kids can go to any part of the world for that much money, answer I got, they will not be able to join, because all of the openings taken by kids of the officials (in Russia for foreign universities exchange program run by "appropriate" people). I'm afraid I have to agree with Vladm. Its not the same place. More prosperous, but due to rip off, not because of fundamental economic improvement. I think that the Soviet Pushkin of almost 20 years ago was much closer, in many ways, to pre-revolutionary Tsarskoe Selo. The profile of its occupants had obviously changed, but there was something relaxed and magical about the place. These qualities have been touristed (apologies for the clumsy neologism) out of the place. Twenty years ago the tourists were mostly Russian - their reasons for visiting, were very different to the endless processing of humanity which goes on today. tsaria, you've got my point of view with 100% expression, Pushkin/Tsarskoye Selo - become money milking machine: level of education for people, who visited today, pop culture our time, they come to town, because its written in the tourist guide, not because this place tells them something, and reason to come - take a picture "me and Catherine Palace". Luckily or maybe sadly AP remaining a side from tourist attractions, luckily because AP not commercialize they way how CP, but sadly because AP cut off from the founds, what AP deserved for restoration. PS: I trust you found your, distinguished, father well Vladm. but don't take me wrong, anger I have about TS or Russia little to do with loosing my father, mostly what this place become, or to what extreme people took there own place. Most of the Russian people blaming situation, what there end up with, but none of them actually do something that can make a difference, for example: education does not exist as a class, schools are not teaching anymore, universities the same way, education places corrupted all the way, in order to pass exams or pass through the grades, parents of the kids need to bribe. So, kids stop learning: because why to learn? - if you paying for it. Medical service, also does not exist, emergency service come to the patient and first question they ask: "how old are you? ", not "what's wrong? ", diagnoses done by wild guesses instead of base on proven medical evaluation: blood pressure, cardiogram, temperature. Patients are not treated at all in the hospital, even if you pay for it. If patient don't have a relatives, usually he/she just left to die with out any service at all. Police stop acting completely: if someone will attack you in front of the police vehicle, they will not going to help you in any way. Everything I described here, my personal or my friends/relatives experience, and not just one or two situational problem, this is country wide horror. Also, I am talking about fundamental base of the country here! Every single direction, I can backup with endless horror stories I've learn during this trip, and high/slow season nothing to do with it. I left Pushkin in 1995, 2 years after your visit, and changes I've seen, will be similar, from what you would see visiting Pushkin today. Restaurant prices, quite changed from that time, for example tea in one of the restaurants in Pushkin will be 200 rubles - about $8 US, honestly this is more than Ritz Carlton in Paris, service and environment not even on comparable level. Other restaurant served duck with raspberry vinegar sauce, but chef forgot to do reduction of the blend - my plate had 1/2 of the duck and 1/2 of the defrost raspberry literally blended with white vinegar, and duck probably died last year from running for its life, however price was about 680 rubles ~$25 US without garnish. I not mind to pay adequate price for its service, if business owner asking that much, he/she discouraging clients to comeback. I am truly believe, I can find better places to enjoy my vacation elsewhere. I went through entire Catherine Park/Palaces, and took close to 2000 pictures, unfortunately time was very compressed. 1. despite huge amount of visitors, entire park able to distribute them across evenly, but I should give this benefit to its original architects. 2. I was glad to see, a lot of reconstruction and repair, but everything about Catherine Park, and structures located there. 4. Taxi in Pushkin arriving with in 4-5 min upon request and taking you to other Pushkin destination no more than $3-$5 per trip. 1. Pedestrians should watch out for cars at all time, regardless of presence crossing zebra, and run crossing intersection, because car, will not wait for you. 3. Pollution of the most of the cars on the really high level due to the bribe method acquiring smog check license, regardless of the car condition. 4. Drivers insist in most of the cases not to put seat belt, only my answer: "I have 2 kids, buzzing them off". 7. Catherine palace divided on two alleys east and west, east alley for organized tour buses and west for regular visitors, because of that, palace looks very small, if you have a desire to see entire palace, you have to ask specifically to take a second tour, and pay for second entry, or just simply sneak in the tail of the second group (in the main entry) and switch behind the yellow cable in the Great Hall joining one of the organize groups (this way you will miss only 2 rooms of the palace). As much I love my hometown, where I grew up, I become very alienated from this place, and all experience of seen my friends and family give me great grief instead of happiness. I agree with Vladim. If I understand what he has posted. On Phil's valid document, the ones and the lower case letters "l" are the same. And they should be for the time period. On the "prop" they are different. I loved good old pica. Sometimes I wish we still had it instead of the myriad of different type faces allowed by our modern day computers. Alixz - its totally up to you how do you arrange your settings, not only on desktop, but when you are browsing. FireFox, for example, allow you to replace fonts: you can switch from serif type of fonts to symmetrical and back without any problem. Numbers are not aligned. I am not saying its impossible, but let 6 step out of line on the top and 3 and 9 step down from alignment, takes significant realstate and precise mechanics, considering folks in 1916th were happy to make typewriter just to print, and not looking for any sophistication for about 20-25 other years. Phil T has sent me this image asking that I upload and post it for his "technologically challenged" self. The point, is of course, that this is a genuine British military document from 1917, that clearly has a 1, i, and I, thus all three are present and were on period typewriters. Thank you for the clarifications, Vladm! It's crazy sometimes what books can teach you about a topic! my pleasure mr_harrison75, I never use single source of information in order to complete research, other point I use common sense. Despite blood relationship between queen of England and Nicholas family, England was on Japanese side according to some treaty. It was the same repeat of the story, like back in war with Turkey, when British NAVY stopped advancing Russian troops to Constantinople. Besides of Hull problem, England was ready to engage in military conflict, unfortunately not on Russian side. The whole Russia-Japan war of 1905 was the consequence of imcompetence. Russia had no desire to enter the war with Japan, who started btw, actually Russians was ready to give up Port-Arthur and politicians had approval from the Nicholas. Japanese diplomats was always modifying demands. Just one point; Japan was close to their bases and supply lines, and not Russia. hhhmm, how about far east Russian territory? 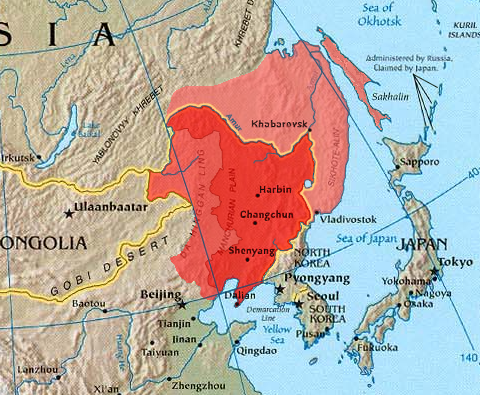 Greater Manchuria, Russian (outer) Manchuria is region to upper right in lighter Red. Russia had land supply, but Port-Arthur was cut off from the sea. Russia fought with a Napoleonic army structure of command, Japan's armies were some of the most modern of their times. about structure of command, Russia continue to have the same command structure, only names of the reports modified, same applies to US or French army. The war was the beginning of the end for Imperial Russia, and all for nothing, because the Tsar had no need of new territories, and didn't kept any. His armies were humiliated, and the laughing stock of Europe, and the Tsar lost most of the prestige he still had in his own country. It was just a mess! Manchuria had one particular reason: final destination for Trans Siberian Rail Road for trade between Europe to Far East, and yes Russian kept territory, otherwise we would not have Vladivostok, just fyi area of Vladivostok add to Russian Empire 1868. Can you see, key with number 1 missing on both sets! This is regarding all typewriters having both cases: CAPS and LOW, however number 1 present on typewriters with only portable typewriters having only CAPS letters, but on text we will not going to have any low case text. btw, in another example from Phil, this mistake not present. Registration under letterhead, is essential part, and never will be present on the right side of the document, unless its part of the standard stamp. Number on the right, usually related to registration for outbound correspondence (as you probably know, one department, should release memo/document, other will send). Now, is something under "lips imprint" , what I am seriously doubt, because if it got extracted or stolen from archive, I see no reason, why they should remove official numbers and leave letterhead for British MI. We can not speculate, what could be under smashed dark section, because neither of us, hold the real document in our hands, and scanned quality is not allowing us to see anything under. One more point, placing big question on entire thing, why did they put on police report, or translation to police report - MI letterhead, to increase visibility of the memo? Rasputin / Re: Tsar involved in Rasputin's death?